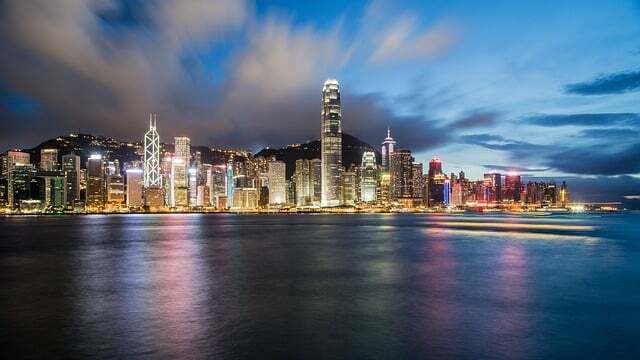 If you are planning a trip to one of the most exciting cities in the world, Hong Kong, you are probably wondering “what to do in Hong Kong” and about the “top things to do in Hong Kong”. This post will give you some great ideas about the best things to see in Hong Kong – you´ll also find some important travel information for Hong Kong and some tips on solo traveling in Hong Kong. 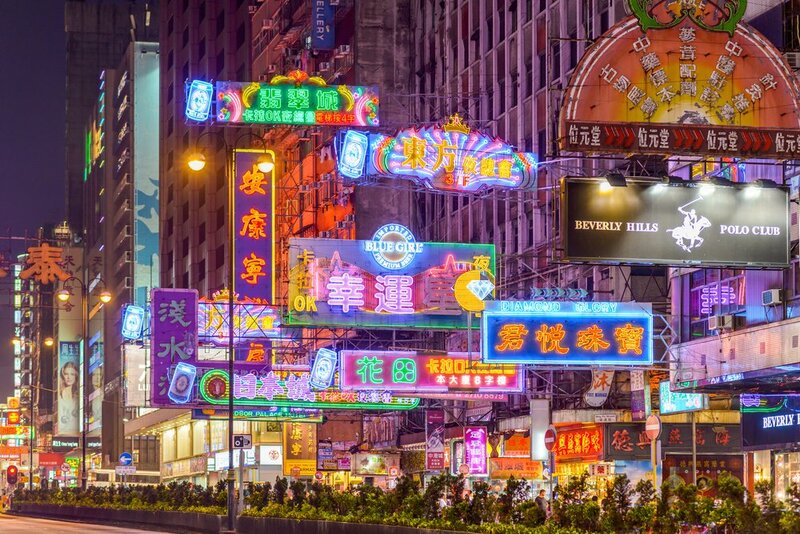 Ready to find out the top things to do in Hong Kong? Here are 20 fun ideas for Hong Kong – my recommendations can be easily done and seen within 4 days in Hong Kong. Last year, I finally visited Hong Kong which I had been crazy to see for a while. 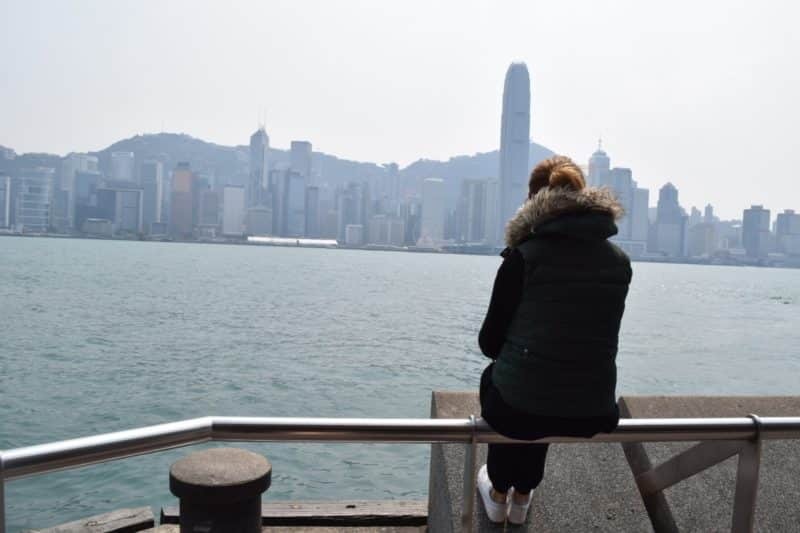 I am a city girl and Hong Kong´s hustle and bustle seemed to be an ideal place to experience a new mega city. 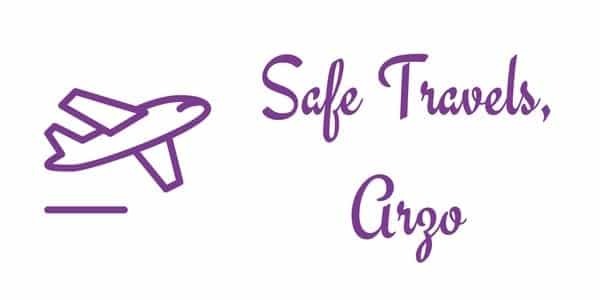 I was more than happy to find out that Hong Kong was considered a very safe place to travel to – especially for a solo female traveler. 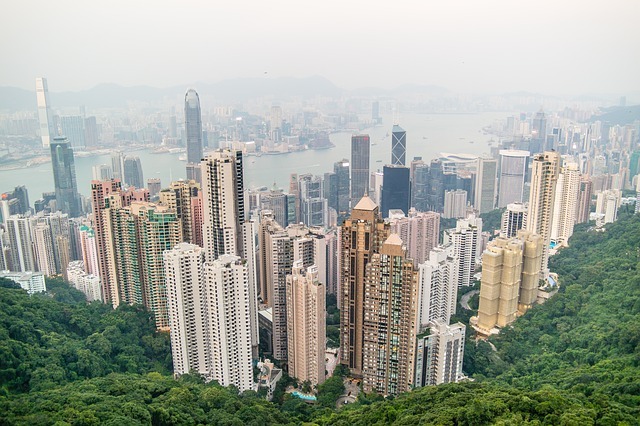 I stayed in Hong Kong for about 7 nights, but if you are wondering what you to do in Hong Kong in 4 days (or 3 or 5, as you can adjust this Hong Kong itinerary) this post will help you to find out about the best places to visit in four days in Hong Kong. Find a short pre-travel guide for Hong Kong before talking about fun things to do in Hong Kong. With a German passport (or any EU passport), I did not need a visa. According to the website of the Hong Kong tourism board, most nationalities do not require a visa if they stay less than 90 days (US-Americans also do not need any visa). May through August can be really hot in Hong Kong, but for the rest of the year, the weather is mostly mild. I visited in March/April and it was lovely, though a bit humid at times. However, at that time of year, there is a huge art exhibition going on and prices for accommodations are much higher. Hong Kong has amazing public transportation, and it is very comfortable using their buses and metros. Though taxis are not expensive, I was very happy to use buses, boats, and the metro (though I normally prefer buses and trams which allow you to see more of the city). If you get an Octopus Card from day one, you´ll be able to save a lot of money while using public transportation. I had a ticket for the hop-on and hop-off bus sightseeing in Hong Kong (I have been using Big Buses forever) which also included tickets for several activities. I actually stayed in 4 different places over the duration of my seven-night visit. Hong Kong has some amazing luxury hotels which are world-wide-known – unfortunately, even budget hotels cost quite a bit though and accommodation might be the biggest part of your expenses. If you like the hustle and bustle, then I would choose a hotel on either the island or mainland, but close to Victoria Harbor. If you prefer quieter areas, which are also more affordable I would recommend staying at Le Méridien Cyberport Hong Kong, which is farther away and is more immersed in nature. 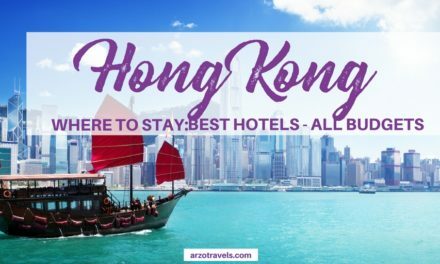 For a full Hong Kong accommodation guide click here and read more about my tips on where to stay in HK! I traveled solo to Hong Kong and (apart from one day I met an Instagram friend) I did all the activities solo. There are many fun things to do in Hong Kong solo – even as a female. 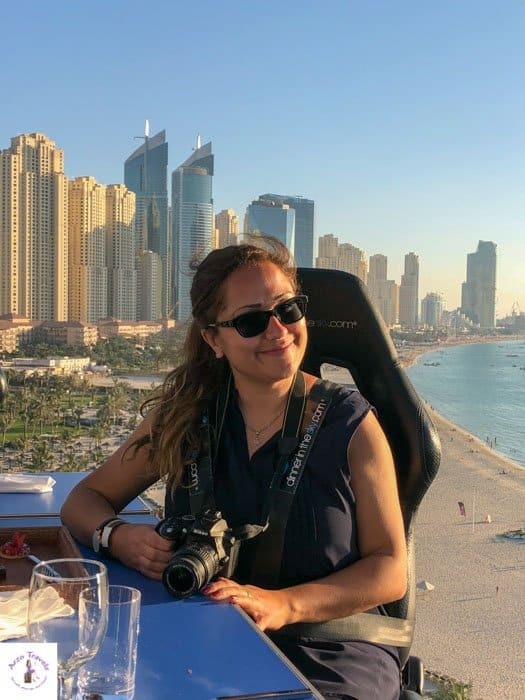 Tips for female travelers: At my first night, I stayed towards the end of Nathan Road in a tiny kind of hotel, and can definitely NOT recommend that area for solo female travelers. I felt safe in Hong Kong and loved strolling along the streets – even in the evening – but did not like that area as there were way more men staring and trying to sell their shop items. However, Hong Kong is a fantastic place for solo female travelers and I would definitely recommend traveling alone in Hong Kong. I did most of the mentioned recommendations below by myself. 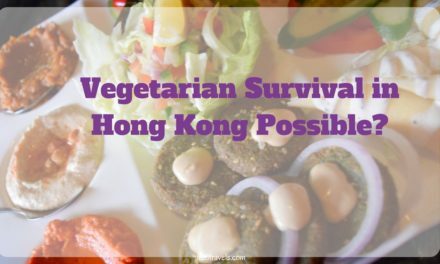 I admit that eating vegetarian was quite difficult in Hong Kong, but I survived and I did not even lose weight, so check out where to find some vegetarian spots in Hong Kong. One thing that I learned in Hong Kong is NOT to save the best for last. I waited on my trip to Victoria Peak until the last day – and was very unlucky with the view because it was foggy/there was a lot of smog. So I have a new piece of advice that I keep telling myself, and also you: do the things you look forward to the most, first. Also, I thought that English was widely spoken in Hong Kong, but I actually had problems communicating with people who did not work in hotels or westernized shops (which was especially difficult as I am a vegetarian and picky with my food). So I had trouble with taxi drivers and could not buy food from stalls since it was not always possible to find out about the ingredients (in case you have allergies, are vegan, etc., you had better check out some words beforehand). Lately, I have become a fan of GetYourGuide and so I started booking my own tours and activities mostly via them. So if you do not know them yet, try them out – you can book many tours all over the world via them, and they allow you (most of the time) to cancel tours for free (let´s face it, sometimes things just come in between) and they send out a reminder before your tour start. So, if you like to do some tours in Hong Kong you will find links to their website. 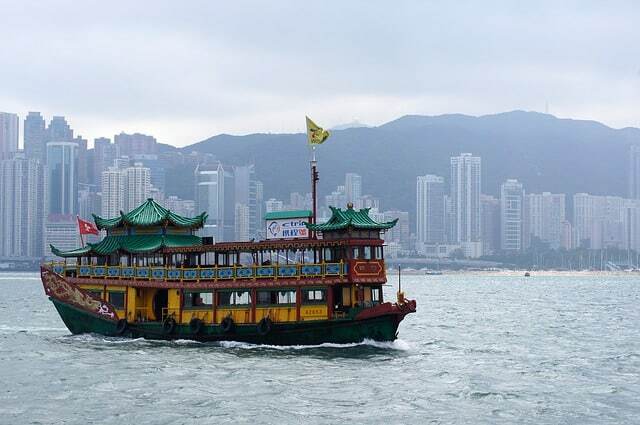 Click here to find the best rates for tours in Hong Kong. Wondering What to Do in Hong Kong in 3-5 Days? 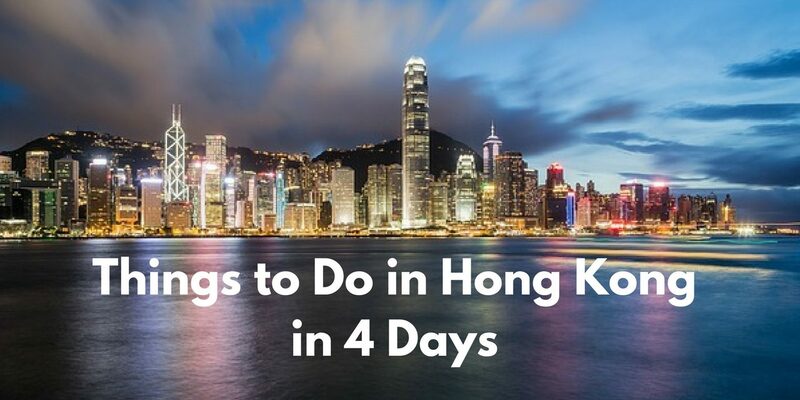 Actually, there is quite a lot to do and 4 days is probably a minimum to explore this hectic and crazy city, but I think you´ll be able to see many important places and sights in Hong Kong within that time – so add these things to your Hong Kong 4 day itinerary! This is not a typical 3 or 4-day Hong Kong itinerary – so how you plan each day it is totally up to you, but these are ideas on things to see in 3 or 4 days in Hong Kong (totally doable). This is probably one of the most iconic views you can get in all of Asia. If you are curious, you can read more about my trip to Victoria Peak here. Tip: Visit this top sight in Hong Kong on the first clear day – Hong Kong can be very foggy and the view can be disappointed if you cannot see anything (believe me, I experience it). As mentioned earlier, I had a hop on and hop off ticket, so the entry was included, if you do not get a sightseeing bus ticket, you can buy a ticket separately. You might have to plan in some time for standing in the line without a “skip the line” ticket though. I love all kinds of boat and ferry cruises and taking a ride on the star ferry n Hong Kong was also fun. It connects the two parts of Hong Kong: Hong Kong Island, and Kowloon, and has been operating since 1888. The ride is pretty cheap and you´ll have a wonderful view of Hong Kong´s skyline so make sure to add this to your 4 day Hong Kong itinerary. 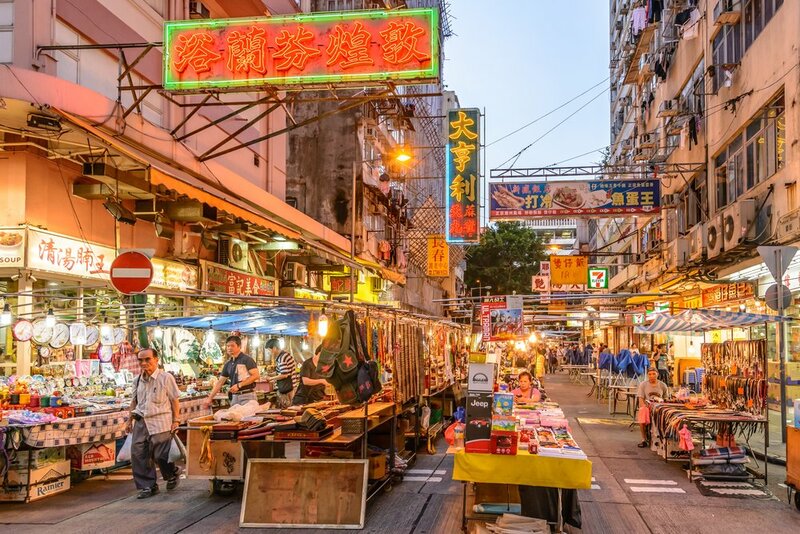 Ladies Market is one of the best tourist attractions in Hong Kong – a 1000-meter-long market with over 100 stalls of bargain clothing, accessories, and souvenirs. There are also things for men, but, as the name suggests, it is mainly female clothes and accessories that you can buy. I did not buy anything, but from hearsay, haggling is essential. When the sun sets and it gets dark, the Temple Street Night Market comes to life. This popular bazaar should definitely be on your list and the best is that I even felt secure as a solo female traveler. 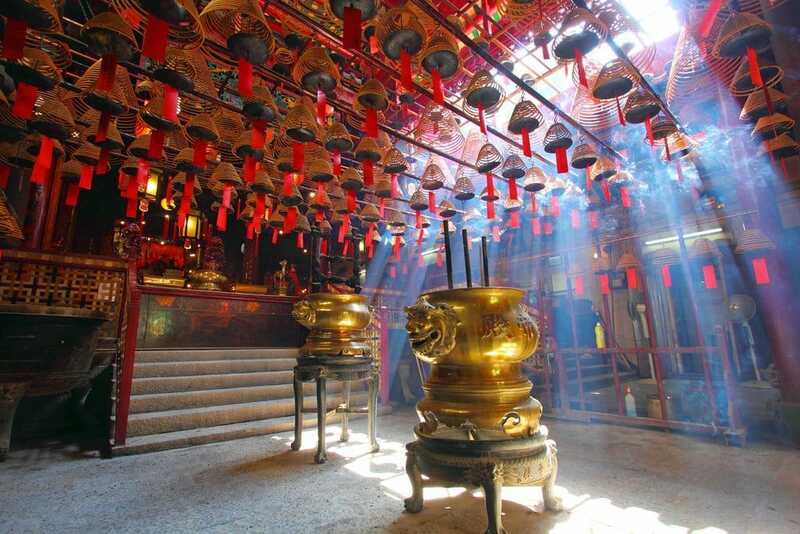 You can find temples all over Hong Kong, and it is a great way to learn about the religious side of the area and show respect for the Hong Kong culture and traditions – definitely a place to visit in 4 days in Hong Kong. I did not see as much neon lights as in New York’s Times Square, but the Hong Kong version of Times Square was still worth a visit – it was crowded like the New York version and there were plenty of shops and restaurants to discover. Another thing you have o do in Hong Kong. Hong Kong is one of the craziest cities I have been to – but surprisingly, to me at least, there is a lot of greenery to find. My favorite park was Nan Lian Garden where my local Instagram friend Nam showed me around. 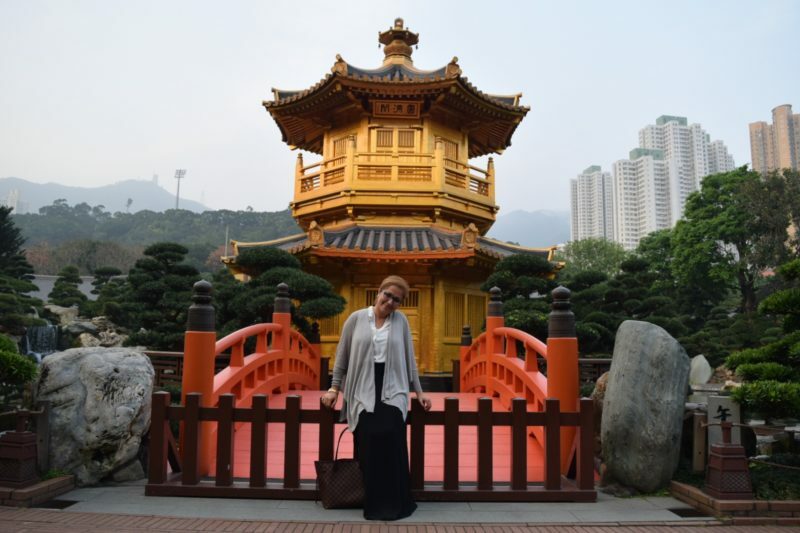 Favorite park in Hong Kong: Nan Lian Garden with Arzo Travels in Hong. So if you need to unwind, plan to visit some parks in your Hong Kong itinerary 4 days. Okay, this is not a place to visit in Hong Kong but eating a lot in HK is a must do. I know that Hong Kong is a foodie heaven, but, unfortunately, not for vegetarians. However, I enjoyed great waffles, a lot of vegetarian burgers (read about vegetarian dining in HK here), and vegetarian dim sums though and recommend trying them out as well. The highest bar in the world is at the luxurious, five-star Ritz-Carlton in Hong Kong and, of course, you´ll have wonderful views over Hong Kong. The staff was friendly, the view great, the bar interesting, and the drinks expensive (even non-alcoholic drinks)– but having a drink at Ritz-Carlton is still one of the top things to do in Hong Kong. Despite the fact I looked tired the staff was wonderfully nice and did not look at me like I was an alien that did not belong there. (Yes, I went to do in Hong Kong solo and though I normally never go to a bar by myself, it was actually okay – the view was worth it). As you know, I love crazy places, and Nathan Road is the craziest road of all. With tons of shops, restaurants, and people, it is surely worth a visit. On my first night, I even stayed there – though I would be more picky with my accommodation there (some houses are kind of dodgy) this is one of the best places to visit in Hong Kong. Even though this place is crazy, it is one of the best things to do in Hong Kong at night alone. Another great to do at night (whether by yourself or with people) is to witness the Symphony of Lights, a beautiful multimedia show of lights at night from across Victoria Harbor. 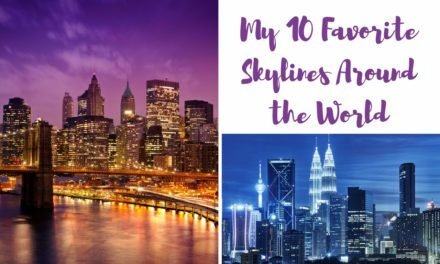 No skyline in the world is as astonishing as Hong Kong’s (check out my post about the 10 best skylines in the world) and the lights and sounds make it even prettier. If you like to see the Symphony of Lights from a different perspective you can book your boat cruise and be totally amazed by looking at it during an evening cruise tour. At the time of my visit, the Avenue of Stars in Tsim Sha Tsui was closed for repair and improvement works. Until they are done (which should be in 2018), some statues are in the Garden of Stars and Starry Gallery in the meantime. I grew up with an older brother, so I got used to watching all of Bruce Lee’s movies. 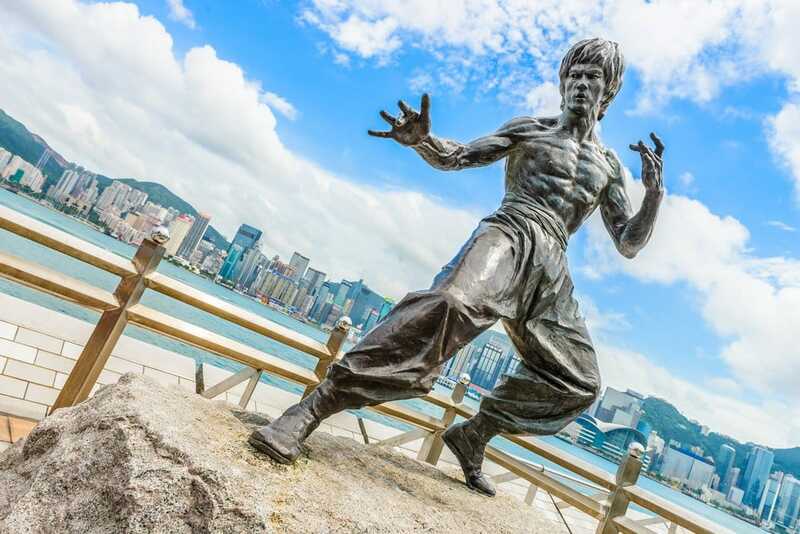 He became our childhood hero and seeing him there was kind of a highlight (now, it is not with Victoria Harbor in the background) in Hong Kong. You can never do too many boat tours. 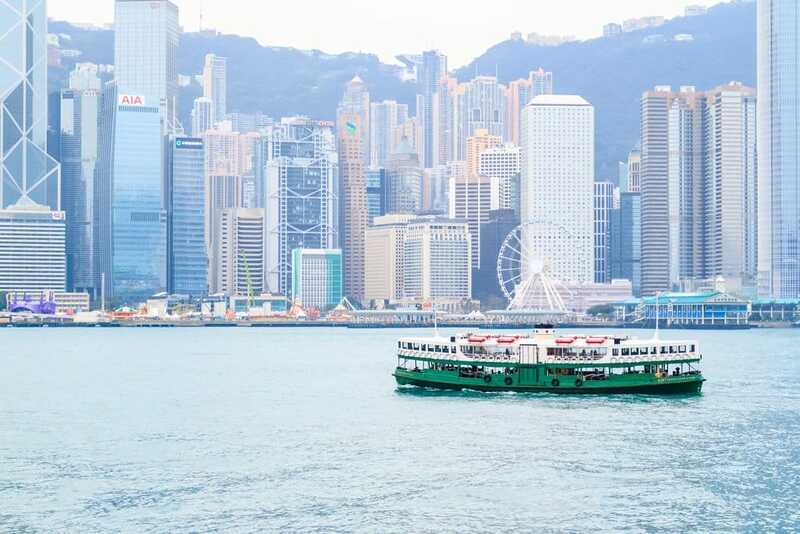 Do a harbor cruise on one of the cute and iconic Hong Kong boats – at almost any time of the year. There are not many more iconic ways to see Hong Kong. I kept this activity for my next Hong Kong trip – which I actually regret so do not make the same mistake and make sure to take a seat in one of the 42 gondolas of the Hong Kong Observation Wheel and see Hong Kong from above. 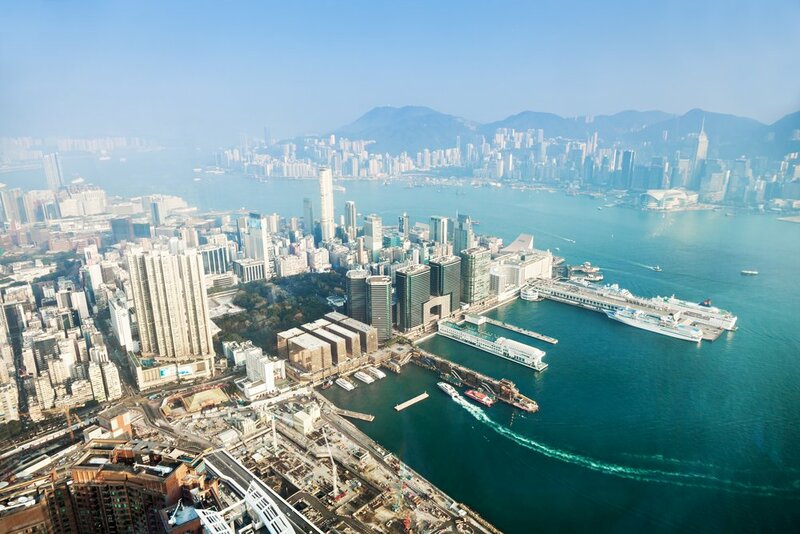 Enjoy the view from Hong Kong´s tallest building and soak in the view with a 360-degree view of Victoria Harbor (if you book the hop-on and hop-off bus tour, the entry for the observation deck is already included, but you have to choose between Victoria Peak or this one. The Clock Tower is one of the main tourist attractions in Hong Kong, so make sure to add it to your four-days itinerary for Hong Kong. Pay a visit to the Clock Tower, which celebrated its 100th anniversary 2 years ago. While I was there, the clock was covered since there was construction work going on (seemed like bad timing for my trip), but this clock has become a famous landmark of Hong Kong and snapping a selfie in front of it seems like a must. My recommendations for day trips are Lantau Island or Lamma Island. 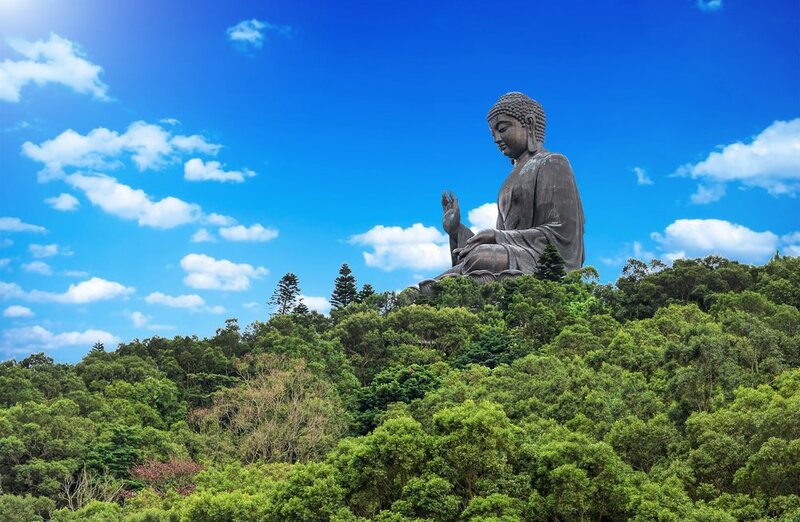 Lantau Island is the biggest outlying island and has beautiful beaches, Buddhist architecture, a cable car, and much more. I, unfortunately, did only one day trip and visited another island, which I recommend. Lamma Island is a beautiful island with beaches, hiking options, and a cute fishing village. Though I do not regret having visited this island, I would love to visit Lantau Island on my next trip. I did go there by myself without a guided tour. If in Hong Kong, a day trip to Macau should be on your itinerary. 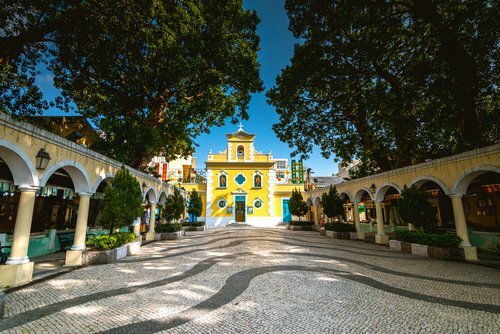 While I stayed bit longer than 1 day, you can see most important travel sights in one day – getting there from Macau is not difficult, and a wonderful day trip. Hong Kong on a budget? If you are looking for safe hostels in Hong Kong read Claire´s post to find out more. Here are more ideas on how to spend money in Hong Kong. 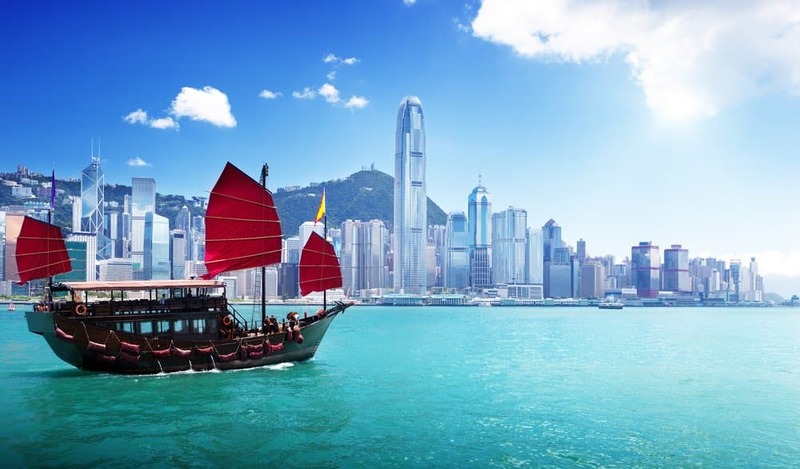 Visit amazing Hong Kong and find out which places should be on your itinerary. 20 places to visit in 4 days.